When I was growing up, potato chips seemed to be a standard in the brown bag lunches I took to school. Now, potato chips rarely make an appearance for our brown baggers. My thoughts -- you don't get much actual food for the money, in a bag of potato chips. Here are some alternatives we've chosen for our family. If I'm going to do chips, it's more likely I'll do tortilla chips. Tortilla chips have substance. They have fiber, and actually fill you up. Spread whole tortillas out on a large baking sheet and spritz with olive oil cooking spray. Sprinkle with any desired seasonings, such as salt, garlic powder, onion powder, chili powder, cumin, or just leave plain. Flip the tortillas over and spray and season the other side. Stack the tortillas up on a cutting board and cut into wedges, 8 or so each tortilla. Place on baking sheet in a single layer, and bake at 400 degrees F for 6 to 7 minutes, until the edges are golden and curling up slightly. Add a healthy dip such as bean dip, salsa or guacamole, and you have a snack which packs a nutritional punch. Bean dip boasts protein, fiber and some veggies, if made with onions, peppers and tomatoes. The salsa is loaded with lycopene and beta carotene. And the guacamole has the good fats. Fats are good for us, in moderate amounts and if they're the right kind. If you're packing a lunch for kids, remember their bodies and brains need these good fats. Guacamole can also have some lycopene (if made with tomatoes) and fiber. If it's just a wholesome snack food I'm interested in adding to the lunches, I'll make a large batch of popcorn and scoop into individual bags. Mini corn or bran muffins make a healthy alternative to potato chips. Small baggies of whole grain crackers also make a great substitute for chips. They're usually baked (less oils) and with the whole grains, have more vitamins and fiber than chips. This summer was a cracker-y kind of summer around our place. I made the lavosh, and the girls got it in their heads that they wanted to do all kinds of crackers. They made Wheat Thins, Ritz, and Graham crackers. 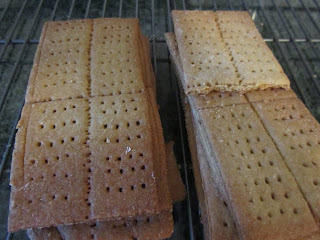 They used online recipes for the wheat thins and ritz-style crackers. But they followed my very old graham cracker recipe that I cut off the back of a box of brown sugar, when my son was a toddler. I used to make these grahams as animal cookies for my kids when they were little. I have these small, animal-shaped cookie cutters. The cookies were adorable, and I knew that they were much healthier than the white flour animal cookies sold at the grocery store. Here's the recipe I use for graham crackers. You can make them rectangular, like store-bought (that's what my daughters wanted to do this summer), or cut out with cutters and adjust the baking time, for shaped cookies. In a large bowl, cream together the sugar and margarine. Add vanilla and beat until fluffy. In a medium bowl, stir together flours, baking powder, baking soda and salt. Alternating flour mixture with water, mix into creamed margarine/sugar. Mix well. Cover bowl and refrigerate for 1 hour, until firm. Divide dough into 3 portions. Roll out to 1/8" thickness, on a sheet of waxed paper that has been lightly dusted with flour. Work your dough into a rectangle roughly 5 X 15 inches. Trim dough to even the edges. Cut into 6 smaller rectangles, about 2 1/2" by 5". Score these rectangles into quarters and prick all over with a fork. Transfer to a greased baking sheet. What are some extra goodies you like to add to the lunch boxes in your house? Thanks for sharing that healthful recipe. I'm going to save it! Lunches are taken daily by my 2 still at home kids (older 2 attend college). Typically, I pack a sandwich on homemade bread, fruit or raw veggie of some kind, a refillable 18 oz drink bottle, and a home baked treat such as zucchini bread, pumpkin muffins, etc. Those crackers look great! Thanks again. Your lunches sound a lot like ours. I like having a really simple formula for lunch bags, the sandwich, fruit/veggie, and an extra, plus water. It makes it easy to figure out what to pack. Graham crackers with icing -- now that sounds yummy! My daughters wanted to make them just like store bought, so made them in rectangles. But I think the real merit to making your own graham crackers is you can cut them into shapes, as you'd do with sugar cookie dough. But it's a healthier cookie than sugar cookies. That's why I used to do them as animal crackers. How well did the crackers approximate the name brands that your daughters made? What was the favorite? Well, the wheat thins were a pretty good approximation. But not a sweet, more wheaty in flavor. But maybe that's a good thing. The ritz I think were harder to get right. They weren't as light and crisp as a store bought version. Still good, just not quite the same. It could be that the baking sheet wasn't just right (we use insulated sheets), or the oven wasn't hot enough. Those are things perhaps not related to the recipe itself, but that we could work on to figure it out. The graham crackers were a lot like name brand graham crackers, but better -- better flavor and crisper. My son grabbed a container full of the wheat thins on his way out the door one morning. A woman in his office was asking what he was eating. He offered some to her and she was quite impressed. So, a vote for the wheat thins. But I think our family's favorite were the grahams. Thank you for the recipe. I have several, but I always preferred to try one that I know has been "tried and true" by someone else. We make tortilla chips too and if we aren't worried about the fat I'll even sometimes deep fry them. I normally only do this once or twice a year to go with a big pot of chili in the fall. I will sometimes deep fry them too. They sound good to have with a pot of chili. I'll remember that. I'd be very interested to hear how that goes. I do sometimes just want some potato chips. I wonder if there is a kind of potato that works better for chips than others. So, let me know what you did and how they turn out. Thanks, Belinda! They are quite good. I wouldn't use them as my sole source of graham crackers. If I can find them at the dollar store, that's by far the easier option. But it's fun to make something like these from time to time. We love tortilla chips, too. I like doing the baked ones because they're so easy, and healthier, too. Thanks! Graham crackers are fun to make in shapes for fun s'mores, too. My daughters made the batch pictured. They love to bake! Just found your blog, so I haven't read much, but it appears you might be gluten free? Is that right, or do you avoid just some of the gluten grains? I'm mildly gluten intolerant. Mostly my problem is with barley, not wheat. (And barley is mingled in with wheat in so many things. So that's where a mostly gluten free diet works better for me.) But I was GF for a couple months to determine what my food triggers are. I've not made these GF. I'll tell you what the texture is like, and maybe that would help you figure out if a GF flour would work or not. The graham cracker dough is a lot like gingerbread men dough. There's no egg in it to bind GF flours. You'd need some gum or chia seeds, I would think. The only GF cookies I've made have been bar cookies, with egg in the dough (to hold it together). Have you tried any of the recipes from glutenfreegirl.com? The ones that I've tried turned out quite well. She does have a GF recipe for graham crackers. It uses sorghum, rice and tapioca flours.